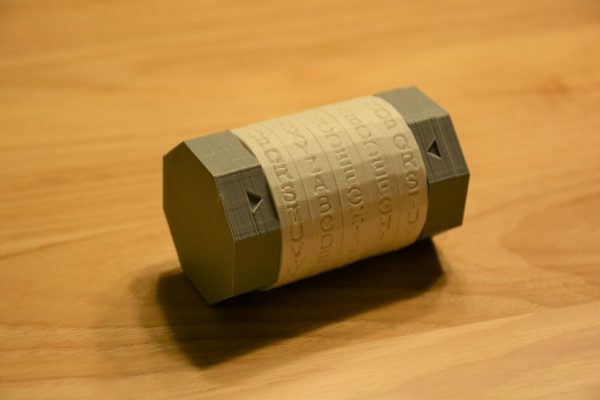 3D Printed Cryptex Puzzle Safe « Adafruit Industries – Makers, hackers, artists, designers and engineers! A cryptex is a renaissance era puzzle or safe that was originally designed by Leonardo Da Vinci. It is now more widely known from the book, “The Da Vinci Code”, written by Dan Brown that has also been made into a movie. Da Vinci’s original concept included a fail-safe inside the cryptex that destroyed the contents if someone tried to force it open. This was achieved by a small vial of vinegar breaking open and dissolving the papyrus that was inside. The version that I designed does not include this, however it can hold much more than paper. I designed it to be a good size for most small items such as a flash drive (probably more than one), or jewelry. It can also be used as a unique gift for someone that is also given a riddle or clue and needs to solve it to get to whatever is inside. This instructable is fairly short, however it may be a bit confusing as to how to put it together and it took me a while to make a working model so I want to make sure others can make it as well.